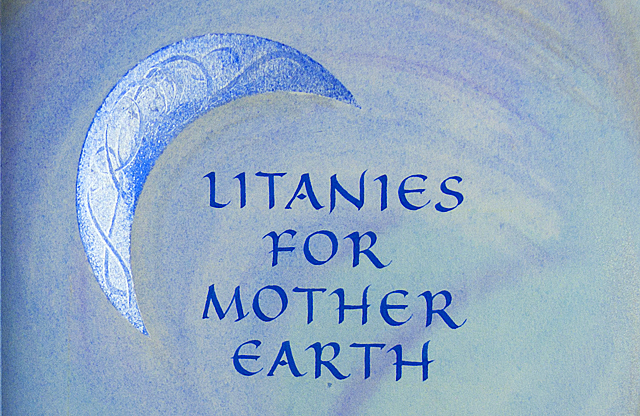 I have added three galleries of images for a few of the Earth poem book series I have been working on for the last few years. 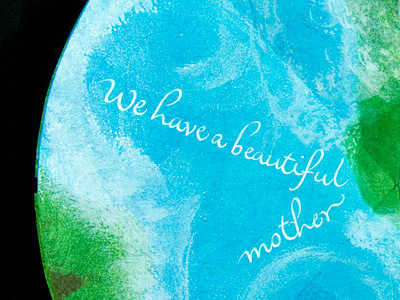 All originally inspired by Alice Walker’s poem, “We Have a Beautiful Mother,” they are each unique books, but share some circular quality, in honor of our round Mother Earth. 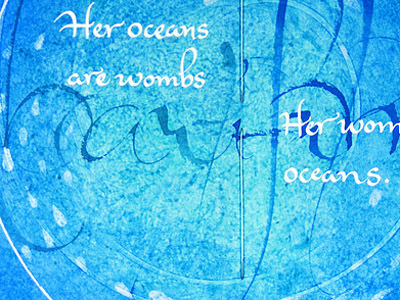 The first in the series, Her Blue Body, is shown in a detail above, highlighting the name of the poem. This is a sculptural book and though it presented some engineering challenges, everyone who has seen it has loved the way it opens up into its half dome shape. Another in the series is entitled A Beautiful Mother and it too explores roundness. Though sewn on ribbon tapes in a traditional way, when stood up and opened until the covers meet, it makes a circular shape. The plaid ribbons, strengthened with acrylic medium before having the pages sewn to them, were from my mother’s collection of vintage ribbons. Roundness is also present on every page of the design. These pages began with abstract underwriting, which was then pasted over with acrylic and wheat paste; other shapes were made using pochoir (stencils), particularly the crescents and the buffaloes. Below are two more details from this book. In the first, the texture is achieved by lifting the wet pasted paper from the glass working surface, leaving a very organic-looking pattern. 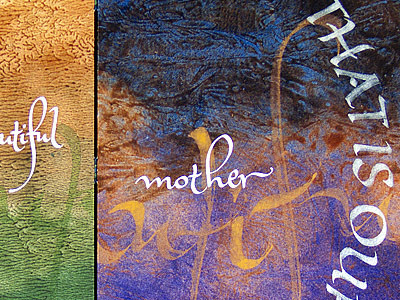 Other patterns are made by using a brayer in the wet pigmented paste to mix and layer the color. On page spreads where the stitching thread is visible, I used small pieces of mylar underneath the thread, then with watercolor painted the thread to match the background color. The last thing to be added to the many layers of color was the lettering, using either an opaque gouache or an iridescent translucent acrylic, writing with broad-edged pens. 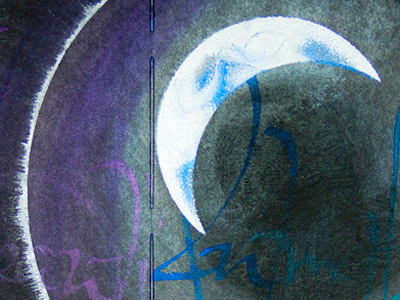 Yet another interpretation of circularity in the series is Litanies for Mother Earth, using a Japanese album style which allows each page spread to be complete unto itself and thus a method much favored by painters looking to bind their pages into a book without bisecting the page spread. The pages are glued together at the leading edge only, and then wrapped into a cover that holds the book snugly in a codex form. The cover is unattached to allow the book to lie flat when open. 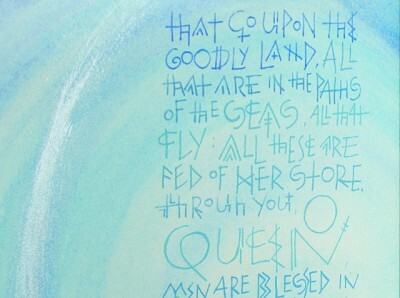 Below is a detail of the title page lettering. It has been pure pleasure to work so closely with these words and to immerse myself in their meaning. 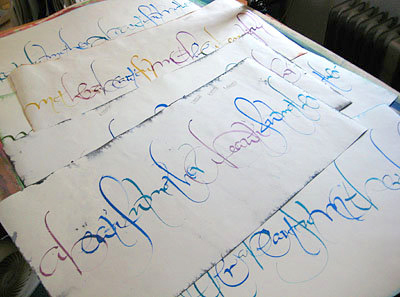 For one such as myself on an earthwise spiritual path, this work has been a prayer throughout my time with it, and though I am pleased to have completed the series of five, it is with some nostalgia that I move on to new projects this year, looking back on these books I have so enjoyed making.